Having been an artist as long as I can remember, I love to paint and create and I couldn't live without color surrounding me. 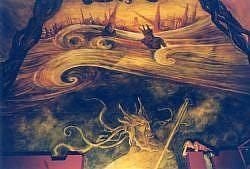 Painting huge is my passion -- that's me in the photo above with a mural I did at Universal Studios Islands of Adventure. You could call me a colorist or impressionistic painter, but you could also see my work as being abstract, abstract expressionist, surrealist, realistic or outsider, to name a few genres present in my art These days I'm leaning more to the abstract, both German expressionist and Abstract expressionist . A commonality in my work is color used as composition and the use of strong diagonals. I often use emotions and personal or universal issues for inspiration. I love trees and forests and the great open skies of the southwestern states. Having an extensive background as a photographer (old-school, black and white), I often use my photographic images as references for my paintings. Influences include Japanese prints, Monet, Degas, Van Gogh, Georgia O'Keefe and the Expressionist artists, especially the Fauves. I'm also influenced by photographers such as Man Ray and Ansel Adams and love Kandinsy and Chagall for their joyful, almost childlike, canvases. Lately I've become a big fan of the Hudson River School of artists, with their awe-inspiring landscapes. A majority of these pieces have been sold. Fine art prints are available in my store at Imagekind.com.